– the honeycomb sucked on so the softer, holier bit dissolves, leaving the hard side. As a child I used to seriously contemplate ditching the hard piece of honeycomb, like when you’d freeze a yoghurt or your own iceblocks and one part would be creamy and smooth and the other icy and yuk. 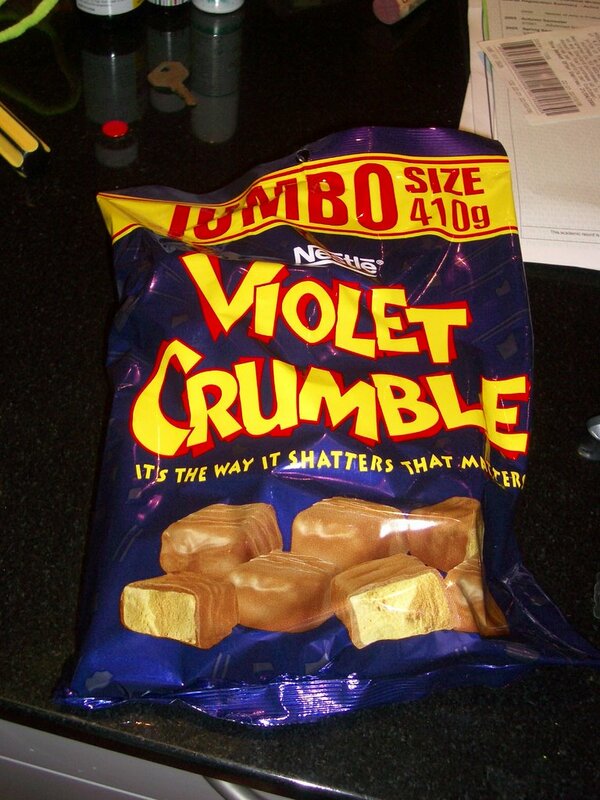 But come on, its a Violet Crumble. None is to be wasted. 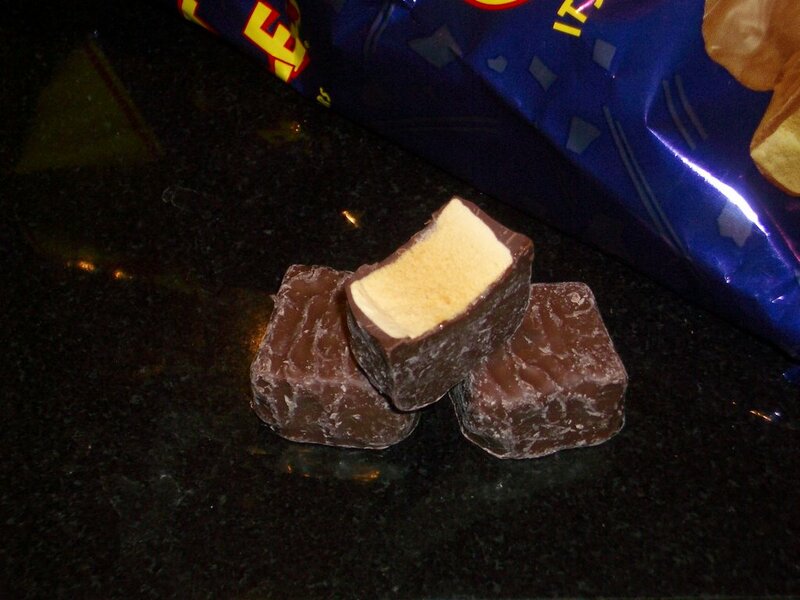 HOWEVER – they must always be consumed as photographed above – from the original bag of Violet Crumble cubes, NOT he individually wrapped bar. It’s bad enough Vegemite, Aeroplane Jelly and Arnotts biscuits are now owned by foreign companies, some things must remain pure to their history. But now, I must talk for myself. I do have a very soft spot for the proper fancy chocolates you buy by the kilo. I love cherry liquers, orange peel coated in dark dark chocolate, smooth creamy fillings in cute little shapes, you name it. There is something about the quality, but its also the anticipation and presentation. The white gloved selector, the little silver tray, the boxing, the ribbon. I love it all. They’re new on the market, as in, probably been around for about a year? I tried to take a photo of the inside, but it was all blurry and before I could try again I’d eaten it. 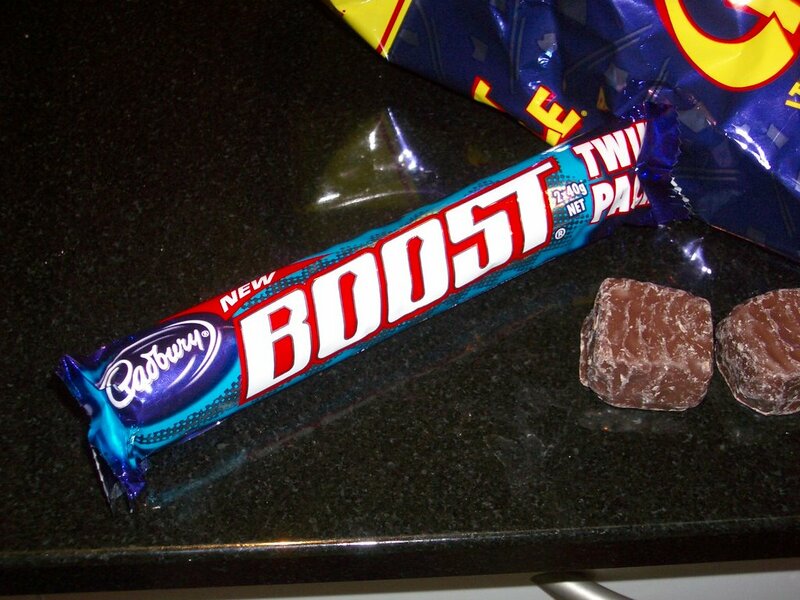 Before this I was a Twix girl, but this, this surpasses Twix by a long shot. Basically it’s a middle of soft dense whipped chocolate (not light like a Milky Way) surrounded by biscuit then a layer of caramel and then coated in chocolate. I used to have to eat chocolate every single day. Then I read If not dieting then what? which completely revolutionised my life and now I am one of those people that loves chocolate but stops when I’ve had enough, which some days is one piece, others a packet. I still find it remarkable that I am now one of those people that can have chocolate in the house and not have to eat it. I do have to hide it because well, there are children and a husband that will vacuum any ‘treat’ food on sight, regardless of desire, need or satiation. So there you have it, Bec – you need to step in with your side of the Violet Crumble story. And I am off to see everyone elses!